In this Kitchen Nightmares episode, Chef Gordon Ramsay visits Zayna Grill on Redondo Beach, California, owned by Fay and her niece Brenda, Mark, Amel and Vanessa also work in the restaurant . Gordon arrives and decides to meet Fay and Brenda separately to discuss what the real issues are. They both think the other should be no longer be a part of the restauran, Fay says she has to do everything as Brenda doesn't pull her weight but Brenda thinks that Fay won't give up control. Gordon orders a dip sampler, fava beans and Kibbi rolls. The sampler features oily dips, the fava beans come with a huge Z on the top in cream, like someone has puked on his plate, the kibbi rolls taste frozen and the Zayna combo platter looks the worst and it is dry with no flavour. Gordon arrives in the evening and customers seem excited to try the food, with hummus being a safe choice for most. Sadly, the hummus disappoints and are sent back. Gordon takes drastic measures and goes to a grocery store and buys hummus, which he takes out to the customers and they love it. Gordon decides it is time to check out the freezer, he finds months of prepared frozen food and frozen meat stored underneath dripping warm water. Gordon returns the next day and Fay claims she has to do everything as no one will help her. After another argument Gordon says that the restaurant will be opening for lunch and Fay is going to go home for the day. They will run the restaurant without her and Gordon will supervise. Gordon reveals to Fay that she will be watching from a surveillance van. Before lunch begins Marks struggles to work the rice cooker. Brenda holds the fort and the lunch goes well despite a few dishes being sent back and an argument between Amel and Mark. Fay is brought back in and it is revealed that she was watching and she tells Brenda she was amazing. Gordon's next task is to cook a fresh meal in the kitchen and they show how unfamiliar they are with fresh fish. Gordon goes into town and discovers that no one has heard of the restaurant. To rectify this he sets up a prime advertising spot on the pier with free samples and the following day Gordon reveals the new bright interior. On relaunch night, things get off to a great start with the staff being positive and communicating effectively. When the orders start coming into the kitchen fast Fay goes back to the old ways and ignores Brenda and Amel, saying nothing whilst manning the grill. Somehow Brenda manages to get through to Fay and she starts communicating again. Overall, despite some hiccups the relaunch was a success. After Gordon's visit. Fay went back to her old ways and as a result Vanessa and Amel left the restaurant, Brenda however was still asserting some level of leadership in the restaurant. Yelp and Trip Advisor reviews are mostly good after Gordon's left and it appears that many locals are now frequenting the restaurant. The restaurant has a new owner, Ray Younis, who appears to have taken over the restaurant as of around September 2015 and reviews are mostly excellent. Their Facebook page is also full of positive reviews and they have added a catering service that was announced on their website. 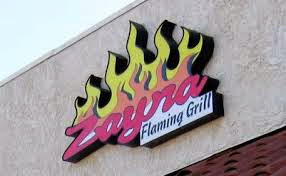 Zayna Flaming Grill was aired on 02 May 2014, the episode was filmed in August 2013 and is Kitchen Nightmares season 7 episode 7 and 8. Yelp reviews look sockpuppeted. Reviewer 'Molecular G.' has 57 total reviews, 10 for Zayna's alone. In SoCal we primarily eat and enjoy 5 or 6 middle eastern inspired places. If something new or a new experience has happened I just report it. Personally, I wouldnt touch the "Before" food from a single restaurant that Gordon has been to since his show started. And the food after Gordon, I will take a look and still not touch it. Because it looks too pretty to eat? Fayza just might be the most detestable owner in the history of KN. At the end of the show, she should have been sent to a retirement home stranded somewhere on a lonely island. A poisonous, evil old hag who seemed to derive perverse pleasure from abusing and bullying her staff and her own niece. It does not surprise me one bit that she has gone back to her old ways. Brenda seemed keenly aware of what was wrong with the restaurant from the start, but she was never allowed to fix anything. It's not hard to see why she would have lost motivation and passion when having to work alongside that monster of a co-owner for many years. Brenda appeared truly competent and her heart was in the right place, so at the very least, I hope that she can stand up against the evil hag from hell. Seriously...As Molecular G.. I have posted favorable reviews for many eateries multiple times because we eat there many times. Most are middle eastern in flavor profile. People of faith is what I would call each of the people who work at Zayna Flaming Grill. Objective is ok, harsh is passable, but your descriptions defy criticism. Watching this episode, I don't think what Fay was doing was evil, but just rooted in a lack of trust. I have been such a person with problems about letting other people help. When I got called out on it a few times by different people, I realized that it was a real problem I had with myself and did some thinking about why I behaved in this way. It all stems from a lack of trust. I had (and still do have) problems trusting other people to do a task the way I want it to be done. I have problems explaining how to do things for other people. Between those two, any collaborative effort I've attempted with people, more often than not, resulted in a lot of screaming and arguing, and the project, if it finishes at all, ends up a disjointed mess. And I realized that it's because I unintentionally expected them to do things perfectly on their first try. Another thing, which I seemed to have inherited from my father, is taking pride in something that I do all by myself. He drilled into me from an early age that getting help means you're weak. (He applied this to everything he did. He refused to obtain medical help except as a last resort, he ran a one-man business by himself, and he felt offended if someone did so much as hold a door open for him.) I realized it wasn't true later in life when I'd see people freely and frequently helping out other people, but old habits die hard. Fay seems to be a person who is so passionate about her work (despite the food being sub-par, but I blame that on her being completely burned out), she does not trust anybody else to work competently with her food. Notice, on Part 2, how as Gordon walks Fay to the car to watch her family try to run the restaurant without her, she is so worried sick about her restaurant that she constantly grumbles about their perceived incompetence, and how it takes a long while for her to be happy when they run the place for a few hours without a hitch. She also refused to teach any of her recipes to her other family members. She is so convinced they cannot do it that she doesn't even try to teach them, or she is so worried they will do it wrong that she figures they're better off not knowing. That being said, if she had problems trusting people before Gordon arrived, she's going to have problems trusting people after Gorden leaves. Especially if this is also an issue with pride, it's not something that can go away easily. I may be wrong about all this though: After all, by bringing Gordon in, she is accepting help. Lack of trust is one thing, but are you a deluded, self-absorbed, manipulative liar? I'm guessing not. Having empathy is admirable, but don't be so quick to lump yourself in with the likes of her. Empathy is wasted on narcissistic sociopaths (which she absolutely is). She withholds vital information, not out of worry for others or the business, but to hold power over them by making herself indispensable, and so she can play martyr when criticized. Did you cry about not getting any help and fighting by yourself when rejecting the help of others? Again, I'm guessing no. I'm sure Gordon was called over her strong opposition. And she only 'accepted' Gordon's help after he laid-bare the truth, denying her the go-to manipulations she employed regularly. Once he left, she was right back to her old ways. The OP had it 100% correct--the woman is utterly detestable. I think this is another case of get the restaurant fixed up and sell. But it could also be the two owners couldn't just work together any longer. Why do people continue to work for people like Fay? Just about every time she spoke she's insulting and demeaning, especially toward Amel. She treats these ladies as if they're helpless, weak little girls that can't be an adult without her holding their hand every step of the way. The way she talks about Amel is the sort of talk I'd expect to hear from a 70 year old "traditional" man, as if the girl is completely unable to make it through the day on her own. No surprise they left soon after filming, because I'd have left during.